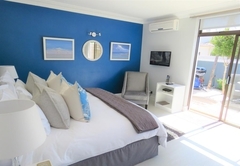 Ocean Breeze Sunset Beach is a highly recommended property providing self catering in Sunset Beach for tourists visiting the Blaauwberg region. 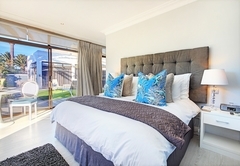 Ocean Breeze is situated in the coastal suburb of Sunset Beach boasting one of the best beaches in the Cape with views towards Table Mountain. 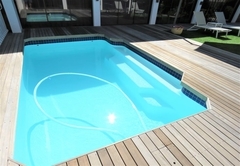 Ocean Breeze has a heated outdoor swimming pool and common garden area. 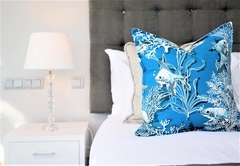 The modern, suites are decorated in colours of the ocean and offer a small terrace, pool and garden view. 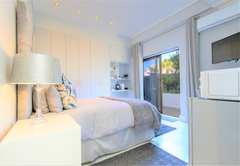 the units are 150m walking distance from the stunning Sunset beach stretching from Milnerton to Blouberg. 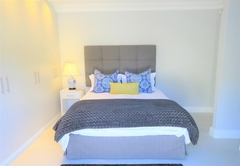 This is a perfect spot for relaxing, bird watching, beach walking, swimming and enjoying being close to Cape Town city centre. The studios and the suite are serviced Monday to Friday. Free Wi-Fi as well as a Flat screen TV with DStv are available. All of the units have pool access. 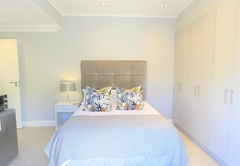 We provide a welcome pack of, tea, Nespresso machine , South African wine, water and other goodies in order to make our guests feel comfortable and welcome. 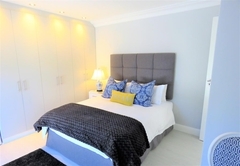 This suite has a Queen-size bed, a separate bathroom with a large shower, a coffee machine, small fridge, microwave, basic crockery and cutlery and an outdoor braai. 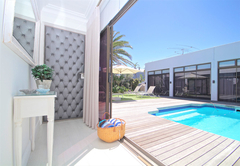 This suite has a Queen-size bed, a bathroom with a shower, a dining / work table, a sun terrace and outdoor furniture. 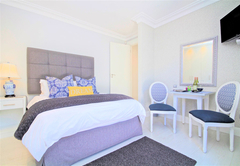 This suite has a large bedroom with a King-size bed, a bathroom with a bathand a shower, a kitchenette, a dining. work table and a braai. 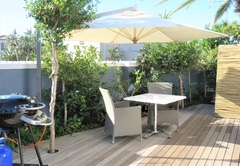 Ocean Breeze is situated within 500m from local restaurants which offer a variety of local and international cuisines. 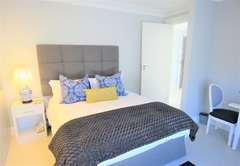 Ocean Breeze is a 15 minute drive from the Cape Town city centre, CTICC, V&A Waterfront, Table Mountain, Cape Town Stadium and the Metropolitan Golf Course and a 25 minute drive from the Cape Town International Airport. Ocean Breeze is perfect for romantic getaways, business travelers or outdoors lovers. The Superior Studio (approx. 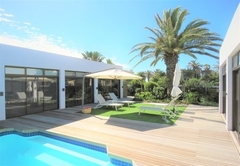 25 sq metres) with pool access. 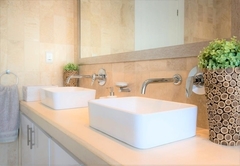 Consists of one bedroom with a queen bed, one separate bathroom with a large shower. 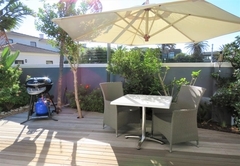 Aircon, Flat screen TV, DSTV, Free WIFI, Nespresso coffee machine, small fridge, Microwave and outdoor BBQ. 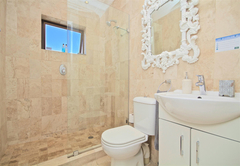 This Exective Studio with no pool access (approx 25 sqm) consists of one bedroom and en-suite bathroom with a large walk-in shower. 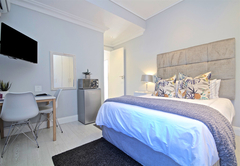 Equipped with aircon, Nespresso coffee machine, kettle, microwave, small fridge, no other cooking facilities, WIFI, DSTV. 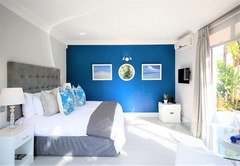 This spacious self catering Luxury Suite with pool access ( approx 35 sqm) consists of one large bedroom with king size bed and dining/work table with garden view, separate large en-suite bathroom (bath and shower), kitchenette, aircon, BBQ. DSTV & WIFI. 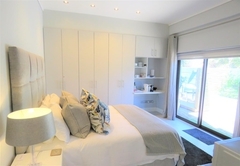 This tastefully decorated Deluxe Studio with pool access ( approx 25 sqm) consists of a tranquil bedroom with queen size bed and small dining/work table, separate en-suite bathroom with walk in shower, aircon, sun terrace. WIFI & DSTV. The humaneness of Ocean Breeze restores and energizes the body! This is a unit about which it is impossible not to rave. Not only does its value exceeds its pricing, but it seldom happens that so much extra care is given to everything. The hospitality of the owners and the staff have been extraordinary. Yves, the owner not only helped with opening up the umbrella on the little patio in front of the unit, but shared useful information in conversation; the manager was ever ready, even on whatsapp, to provide with additional information and ensure that everything was in order; the cleaning ladies are immaculately cleaned the entire unit on a daily basis, and took care of our laundry with huge smiles and so much friendliness and consideration. 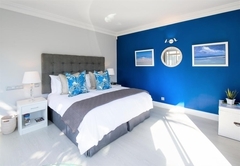 This is a place where you indeed feel that the owners and staff want you to enjoy your stay and are delighted when you do. 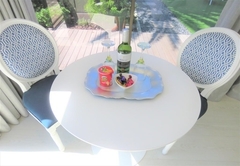 Their extra care can be seen in the bottle of wine, several delicacies... and then the Nespresso with several capsules of a wide variety awaiting your arrival. 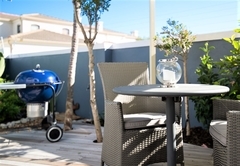 In addition, besides the possibility to make your own meals in the little kitchenette, a gas-barbeque allows for "braai" (barbeque) on the outside wooden deck, enabling one to listen to the sea with a glass of wine. Thank you guys, these do not often come with the package! 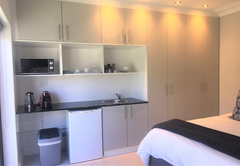 In a similar manner has extra care been given to security making this a safe space where you can indeed enjoy and rest without anxiety. The concern for the ecology can be experienced by the bird feeders attracting a variety of species, as well as in the way the effects of the drought in the Western Cape are dealt with. 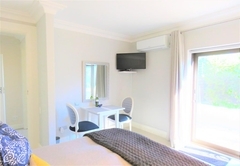 The unit in which we stayed is extra large, consisting of a bedroom (with enormous bed), a kitchenette with everything required, and a bathroom, all immaculately maintained and sparkling clean. Wonderful stay at Ocean Breeze! I absolutely loved my five day stay at the Ocean Breeze in Sunset Beach! I booked the Queen room and was not disappointed in the facilities in the least! The owner Yves was so nice, helpful and pleasant and I enjoyed conversing with him. 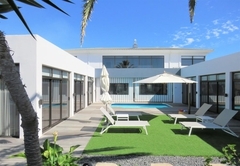 The house itself is located in the Sunset Beach area which is right in the heart of the beach town. The room was amazing, clean, with very nice decor and very, very clean and comfortable. 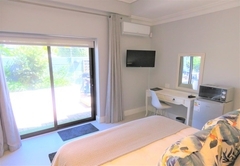 I had a desk, fridge, coffee/tea maker, TV and microwave, safety box, hot shower (Capetown is experiencing a water shortage, so I made sure to make use of the bucket in the shower to conserve water) and plenty of closet space, as well as a private and secure entrance to the property and my room with daily maid service. Because I booked the Queen room, I, in addition, had access to the BBQ grill and the pool. 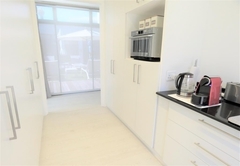 There are no cooking facilities in the room but you can heat up food in the microwave if you choose. Yves was wonderful and gave me great information about where to go. I loved the extra touches such as the complementary bottle of SA wine ( so good! ), with chocolates, bottled/sparkling water, snacks, coffee, and tea which was great to have during the cooler mornings when I woke up. There is a booklet about everything you need to know and understand about the property/room which I found informative and helpful. 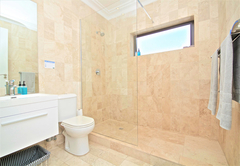 One of the best aspects of the property is it's location. It is literally down the street and around the corner (2 minute walk) to the Sunset Beach! The views of Table Mountain on the beach are spectacular and absolutely breathtaking! I walked the beach every morning because the views were just so stunning and the sunset was beyond! 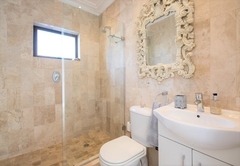 The property is in addition, about a less than 10 minute walk to the MyCiti local bus which the locals use. This line which takes you all over Capetown, including the Front Street Pier and inexpensive. Response timeOcean Breeze Sunset Beach typically responds to requests in 5-10 minutes.